3-D Printing. STEM. Student-authored eBooks. Math assignments illustrated in iMovie. Clay models that become animated characters in educational apps. 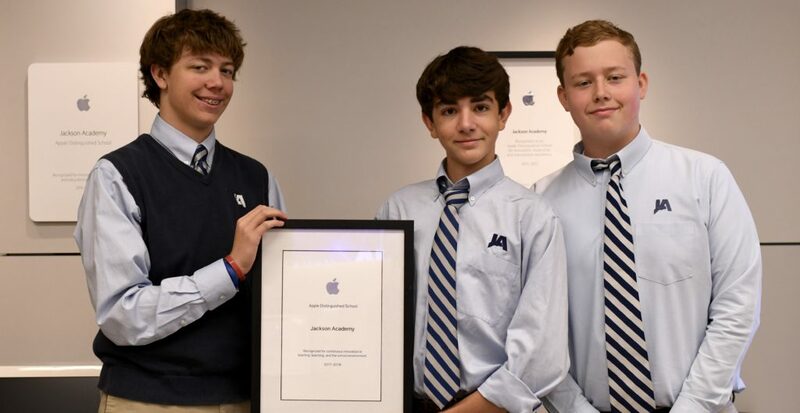 These experiences prepare students for the future and are reasons Jackson Academy has earned the coveted Apple Distinguished School designation for the third time in a row. JA received its first Apple Distinguished School mark in 2013, after launching the state’s first K3-12 grade one-to-one program, where every student and faculty member is provided an Apple device to enhance teaching and learning. Every two years, the school submits documentation in the form of an eBook. Apple reviews the submission and determines if the school is providing exemplary use of technology for its students. JA was Mississippi’s first K3-12 Apple Distinguished School and is one of only a few hundred K-12 schools in the world to have become an Apple Distinguished School. Teachers have also stepped up to make sure they are in the best position possible to guide students in the use of technology. JA teachers are now 100 percent Apple certified. Snider, who spearheaded the Apple Teacher certification process, sees teacher certification as an important step to ensure teachers are even better prepared to guide students in the appropriate use of technology. In appreciation of teachers’ efforts, Apple will send personalized certificates to each Apple Teacher. Read more to see examples of today’s exciting classrooms. Students in Katie Chustz’s Middle School STEM lab use their computers and a CAD application to design individual solar powered flashlights. Chustz wrote and was awarded a grant to integrate additional technology and use the 3-D printer for a project. In addition, students record videos about the project and send them to a partner school in Zimbabwe. Students in Zimbabwe will receive the solar powered flashlights created by students at JA. Fifth grade students in Grace Simmons literature class are working to become published authors. Each wrote an individual eBook creating both the illustrations and authoring the story. Students scanned their original illustrations and produced the book in Pages. Through ITunes U they are working to publish their eBooks. To enliven math lessons, fifth grade faculty member Amanda Smithers has students do a math assignment in iMovie. Students use the program to convert the assignment into a movie. They have to act out the problem and be creative in presenting the solution. All fifth graders take a digital citizenship class during their special subjects period. During this year when fifth graders first get their Macbook Air laptops, they are given guidance in a class that covers all things digital including cell phone usage. The class is a way to model safe behavior online as well as good online manners. Students are reminded that individuals often feel braver in what they will say in the seemingly anonymous online environment. However, through this class, digital usage policies, and parent reinforcement, JA encourages online behavior that is safe and practices good manners. Bronwyn Burford offers an online digital citizenship course for ninth grade. She says it is to remind and refresh what students learned when taking their first digital citizenship class in fifth grade, yet offering more in-depth topics. Students are encouraged to take this class in ninth and required to take it before they graduate. The course gives them an experience similar to a college online course, which requires paying attention to due dates and becoming accustomed to a self-paced course. Teachers manage screen use with the Apple Classroom App, which gives them the ability to observe live views of students’ screens. Teachers can see if students are in the right lesson. If not they are not, teachers can lock them into the correct one. This tool helps teachers keep students on task and using the appropriate application for the lesson. JA wants students to see their laptop as their personal device so they will use it, but employs filters, rules, and time constraints. JA uses content filtering software to safeguard students’ access. Everything a student does on his or her JA computer whether on campus, at home, or five states away, it is always going to come through JA servers and be filtered. At the same time, JA has rules set in the filter. Social media sites open at 4 p.m. and close at 7:30 a.m. JA has rules set for certain ages. Some grades have access to things that others do not, such as YouTube, all with age appropriateness and need for access in mind. The Tech Center does Meet Your Mac with the fifth grade. Lori Snider meet with students in their Language Lab or the Learning Commons every month. In Meet Your Mac sessions, students learn about workflow, calendars, and reminders, for example. The tips help students know about tips on turning in projects and assignments on time, and even managing out-of-class activities and schedules. Snider goes to their Language Lab or to the Learning Commons to meet with the students. An Upper School science teacher has an iPad on a stand and she uses it to put an object under the iPad and then draw on the iPad to illustrate something about the object she is showing. Upper School teachers use AirDrop to send documents, links, or a photo to all students. “It is a faster way to get a group all together on the same website or bring their focus to a particular image, Keynote, or document,” said Lori Snider.